REYKJAVIK, Iceland (AP) -- The Lehman Brothers bankruptcy threw the United States into an epoch-defining financial storm. Imagine 300 of them going bust at once. The last in a series of prosecutions of those deemed responsible started this month and the hope is that it will give this country of 330,000 people some closure after years of reckoning and reconstruction. Icelanders have become more cynical about political and business leaders, to the point of drafting a new constitution. The top financial entrepreneurs of a generation have been thrown behind bars and the economy has had to be reinvented more profoundly than most countries affected by the crisis. "Icelanders experienced the crash as a deep betrayal, not just as a serious economic loss," says Jon Olafsson, a professor who advises the prime minister on ways to improve trust in the government. "Politicians, businessmen and the media told the public, over and over, that everything was fine and people believed them." Everything was not fine. Over the span of one week, 90 percent of the financial sector defaulted. The collapse of Iceland's three major commercial banks — which had grown 20-fold over the previous seven years through debt-fueled acquisitions abroad — amounted to the third-largest bankruptcy in modern financial history, according to the Icelandic financial regulator. For the United States, an economy 1,100 times bigger, it would be like if 300 Lehman Brothers defaulted simultaneously, it notes. An economic depression followed that saw people line up for food aid, an unprecedented sight in this country with a progressive welfare state. Families stockpiled goods from supermarket shelfs and thousands emigrated. Johanna Thorvaldsdottir, a goat farmer, had a mortgage in a foreign currency — a common practice then because of the strength of the local currency and lower interest rates abroad — when the Icelandic krona lost nearly half of its value overnight. The cost of her debt soared. "I worked every evening, sometimes until midnight," she says. Had it not been for a crowdfunding campaign, raising $90,000 from donors worldwide, the family estate would have been seized by bank creditors. "We were lucky," she says. "Many people were not." As big as the shock of the financial crisis was, so was the country's determination to put things right. It emerged from recession in 2011 as it refocused the economy on tourism and technology, and it has been more aggressive than most countries in going after the culprits of the crisis. Altogether, 29 men and two women have been sentenced to a combined 99 years of prison, for crimes ranging from insider trading to market manipulation. Six cases are still in the appeals process. By comparison, no top Wall Street executives have been prosecuted in the U.S.
Last week, Hreidar Mar Sigurdsson, the former CEO of Kaupthing Bank, stood trial in the last criminal prosecution related to the financial crisis. The 48-year old has been sentenced in four prior cases, to a total of seven years in prison. He now stands accused of rigging share prices in his bank two months before it crashed. He denies wrongdoing. While a guilty sentence is unlikely to send him back to prison, as he has already served the maximum time for such crimes, it would help draw a line under the cases, which have dragged on for years. Sigurdsson began his career at a fish factory in a small town before entering finance, and was during the booming years hailed as a self-made genius. In some ways, his story reflects that of the country, which in the 1990s embraced the flashy world of finance to attain the wealth that the traditional industries could not provide. The media frequently referred to aggressive entrepreneurs like Sigurdsson as modern-day Vikings raiding foreign shores for acquisitions. In the end, it led to disaster. Iceland is bent on "learning every lesson from the crisis," says Iosif Kovras, director of Accountability after Economic Crisis, a research project based in City University-London. He contrasted Iceland's approach with that of Ireland, where the crisis was also traumatic but took longer to unfold. The country received a bailout from fellow European nations that took years of reforms to complete. "It did not prompt the same political urgency," says Kovras. "Iceland's apocalyptic crash cleared the way for gathering evidence and data." The University of Iceland this month marked the 10-year anniversary of the crash with a symposium hosting over 100 speakers. They ruminated on topics like the crisis' impact on cardiovascular health, pop-song lyrics, patriarchy and popular protests. "There is no formula for restoring a peaceful, democratic society," former President Olafur Ragnar Grimsson said in an evening-long public broadcast reflecting on the events. "Amid the crisis, when the situation was revolution-like, I feared not for the economy but our recovery as a nation." Reforms of the financial sector have focused on making it less risky. Already there are those saying the rules should be relaxed to allow for faster growth, as the U.S. did this year. President Donald Trump's administration eased a 2010 law that had sought to limit risk in the financial sector and protect taxpayers from bailing out banks. Critics including Trump saw it as red tape holding the economy back. Others suggest that loosening the rules would merely increase the likelihood of a new crisis and that Icelanders already seem to be forgetting the lessons of the crash. 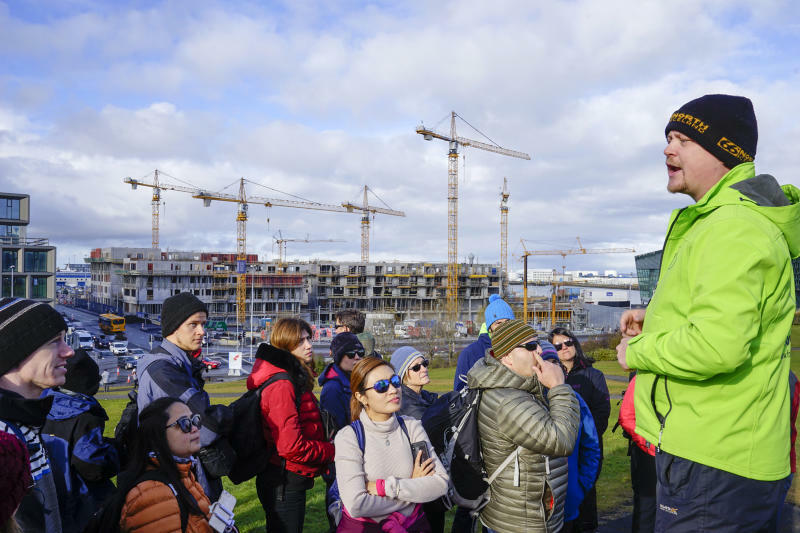 Thorhallur Thorhallsson, who works as a tour guide in the capital, notes the proliferation of building cranes rising from the skyline. "We are so used to cranes occupying the sky that it was decided to make them our national bird," he tells a half dozen tourists gathered by the statue of the Norse explorer who is said to have settled the island 1,100 years ago. "In fact, today, Reykjavik has more building cranes than before the 2008 crash."